Workers who plan to look for a new job in 2018 may be tapping into a growing trend. A 2016 study reveals that 26 percent of full-time employees in the United States intend to initiate a new job search in the coming year. What’s more, another 15 percent of surveyed respondents have already started looking. The current market looks attractive. A low unemployment rate favors job seekers because fewer candidates are available for open positions. All the same, any job search can be stressful. Unanswered questions at the start of the process loom on your mind. Am I targeting the right companies? Do my skills and experience match up with other candidates? Am I fully prepared to interview? Hiring organizations no longer hold an advantage over prospective employees. “You want the job, right?” may have been the preliminary thrust during previous encounters with hiring managers, but not anymore. In contrast, companies now recognize that social media adds a new level of transparency and information sharing. Specifically on how they conduct interviews and treat applicants. “If the job interview experience is negative, employers know that it will reflect poorly on [their] brand,” according to a U.S. News & World Report job preview for 2017. Not only is the interview process becoming less adversarial, but “employers are trying to communicate more clearly and often, and working to project an open, friendly attitude,” the report states. It’s understood that demanding jobs are physically, mentally and emotionally draining. The net result can be a lack of focus when it comes to finding a new position. Career coach Caroline Ceniza-Levine advocates for preserving your personal energy reserves. “Exercise, meditation, enough sleep and good eating habits are all career moves when they give you the stamina to make that extra push,” she writes. When was the last time you updated your resume or CV? If you can’t recall, then it’s probably due for a rewrite, as well as a fresh look. Hiring manager Tom Duffy suggests using charts, tables or other types of visuals to illustrate relevant facts. Look for ways to stand out from the crowd, such as creating a flowchart or infographic that shows you’re the right person for a particular role. Also make sure that your LinkedIn page is current with a profile containing keywords pertinent to recruiters in your desired job sector. Many employers rely on virtual applications as the first step in screening job applicants. Online forms can be lengthy, and there’s a temptation to move through them as quickly as possible. However, that’s not in your best interest, especially when there’s an option to provide free-form information in a cover letter or e-note tailored to the position. Use short paragraphs and bullet points to make the note succinct and easy to read. Sign off with your name, email address, primary phone number (including the discretionary note “call or text”) and links to your professional profile and social media accounts. While you don’t need to provide your full street address, list your city and state in case the employer uses keyword filters. Changing jobs within your field can be nerve-wracking, and the tension tends to ratchet up when pursuing a completely new career direction. In either case, you need a strong personal network to lean on for support. “Turn to family members or friends who can help you brainstorm ways to market yourself or be a second pair of eyes to review your resume,” recommends personal and behavioral finance expert Gina Horkey. “You might even start seeking out other people who are also looking to escape their current careers.” Those types of interactions provide the opportunity for networking and accountability, she adds. 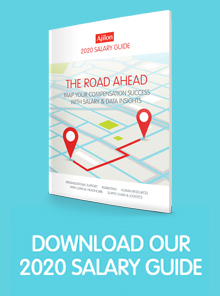 Serious candidates should also check out Ajilon’s 2018 Salary Guide for the latest information on what the best talent is earning in HR, non-clinical healthcare, and supply chain and logistics positions.